The years 1993 and 1994 were very stressful ones for my family and I. Many times I felt as if I would break if even one more disastrous event happened to us. Thus, the idea of "Breaking Point" was born. The focal tree symbolizes each of us as individuals and the blowing wind and rain are the inevitable storms of life we all must endure. One way to survive is to bend and ride out the storm rather than fight against it. I feel this relates to the stress all people face, especially those in middle age who must deal with issues such as aging parents, teens, and sometimes life threatening diseases. 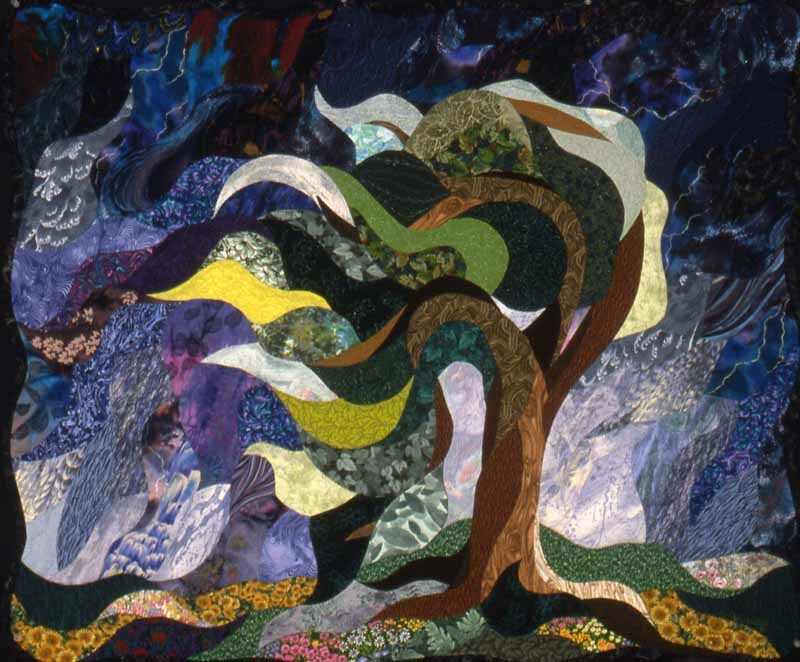 I was inspired to make this quilt as I watched a beautiful tree in our front yard buffeted by a storm in the spring of 1994. I felt just like that tree. Ironically, as I was sewing this quilt in the summer of that year a major part of that tree was toppled by a violent thunderstorm.